Some of you who may have read my previous blogs could be wondering about the motivation behind this trilogy of blogs on Harpers Ferry. My first inclination had been to write only this particular blog that I am about to pen, and this was based on a trip that we had made to the town very recently. But then I realized that I have been experiencing Harpers Ferry and writing about it for some time. Some history in this regard was needed before proceeding. The earlier blogs on the topic of Harpers Ferry, and the background material needed for them, flowed quite naturally from this realization. If you are a regular reader of my blog, you know by now that Harpers Ferry has been a part of my weekend runs for several years on the C&O Canal, although more frequently in the past than in current times. 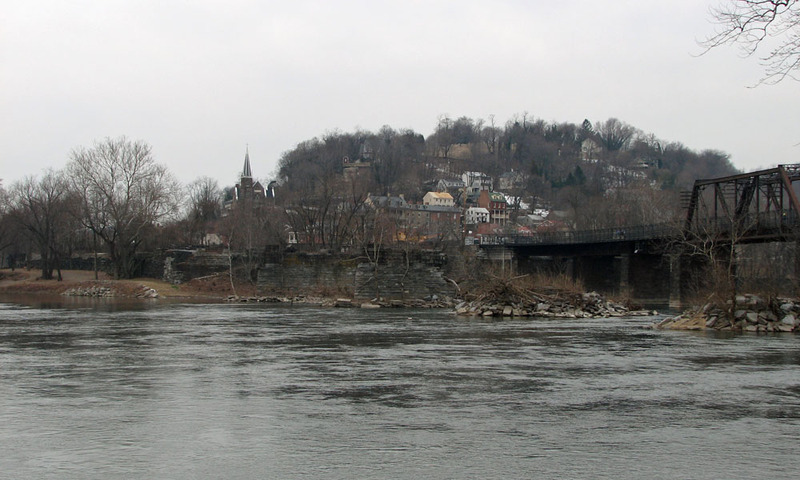 But one does also occasionally wander into the town itself from across the river, either when one decides to cross over the river to the tip of Harpers Ferry, to the confluence of the Potomac and the Shenandoah, or when one goes into town for tourism purposes when we have visitors from other parts of the world. Thus is was that we found ourselves recently visiting the place twice this year, in quick succession, accompanying visitors. You would think that such visits into town would tend to become monotonous, but the amazing thing is that I am finding new things about this place called Harpers Ferry. I am actually beginning to get a better sense for what life must have been for people living here in times past, starting from when Robert Harper moved to the area in the 1760s. I am now also more fascinated by the history of the town in the simplest sense of the word, i.e., in terms of how people lived there rather than in the sense of its place in history, about how the town grew and even prospered before the inevitable impact of the passage of time, and even about simple things like how the layout of the town changed over the years (there were actually even a few canals that flowed through town at one time or the other). Perhaps a day can come when I can even get a sense for how people generally felt about their lives in Harpers Ferry. So what is it that has roused my enthusiasm about the place you ask! As background for getting a better insight into my frame of mind and my thinking about this subject, I will note that one of the first things worth knowing about current Harpers Ferry is that the National Park Service (NPS) has done a bang-up job bringing the town back to life, both physically and virtually, after its having been destroyed over and over again by floods, something that almost led to abandonment. Today, people only live in the upper parts of town above the flood lines. The lower part of the town is dedicated to the tourists. Besides the mom-and-pop shops and restaurants, there are still many previously abandoned buildings of the old town that remain in this lower part of town. In spite of having been to Harpers Ferry many times, this was the first time I discovered that many of these abandoned buildings have been converted to museums. Each building addresses a different aspect of the town’s history and background. This is a work in progress, but the NPS have already done an excellent job. There is an attempt to cover all aspects of life in a little town over the entire period of its existence in a systematic way. Of course, significant turning points in history, like John Brown’s insurrection, and the important battle that took place in and around the town during the civil war, are prominent subjects for presentation, but one also learns about the life of ordinary people, including the experience of blacks at that time in history, or the commercial story of the town (as noted, it was once a prosperous town), the functioning of the armory that the town came to be identified with, and the impact of the railroad and the floods on the town over the years. You can feel like you are living the experience. With more and more trips to the town, I might actually begin to remember what I see and read in the museums and be able to relive those times in my mind rather than just remember the experience of being in the town! This year was the first time we walked through the ruins of Virginius, a little island on the west side of town that at one time was Harpers Ferry’s center of commerce. They made good use of the power of the waters of the Shenandoah to fuel the commerce and help the place flourish, by diverting some of the water into tunnels under town in order to use its power. But ultimately the river was not controllable! For the first time, we found the original site of John Brown’s fort, originally a guard and fire house. The site is on top of an embankment that once used to carry a railroad line into town. (The remains of the railroad track can still be seen under the sand in places.) The embankment runs parallel to Potomac street. John Brown’s fort has itself been moved around quite a bit over time, even to places outside of Harpers Ferry. It has come to rest in its current location near the confluence of the rivers most recently. And then we discovered the site of the original buildings of The Armory behind the embankment I mentioned earlier. None of the armory buildings still remain, having been razed to the ground to support a railroad yard more recently in time. But you can walk in the area and get a sense for the place. There are markers that tell you a little more about the place itself. It turns out that after all these years I am still learning new things about Harpers Ferry. I even have a better appreciation for how the place must have looked in different times. I will be back, and hopefully I will continue to have my curiosity piqued, and I will actually remember some of things I read, and I will also continue to learn. Maybe Harpers Ferry will remain with me forever! My regular exposure to Harpers Ferry over the years has primarily been because of my weekend runs along the C&O Canal towpath. 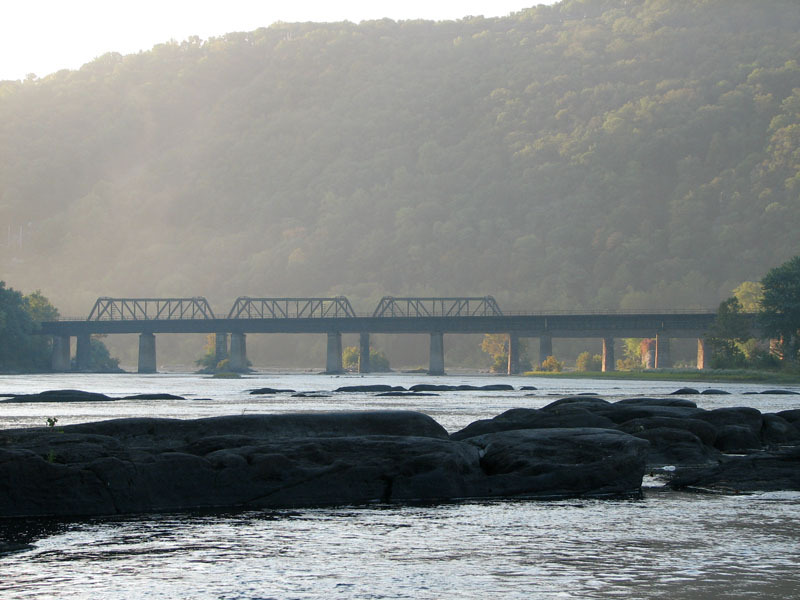 It has been mainly about the connection between the town, the Potomac river, and the railroad line that crosses the river and passes through the town. 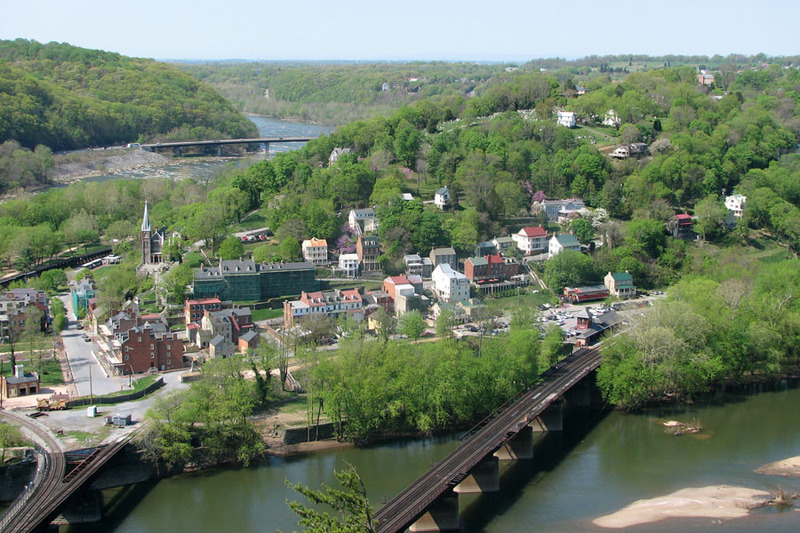 I run past the town on the other side of the river, under the railroad tracks that cross over the Potomac into Harpers Ferry in West Virginia after emerging from the Harpers Ferry tunnel on the Maryland side of the river. 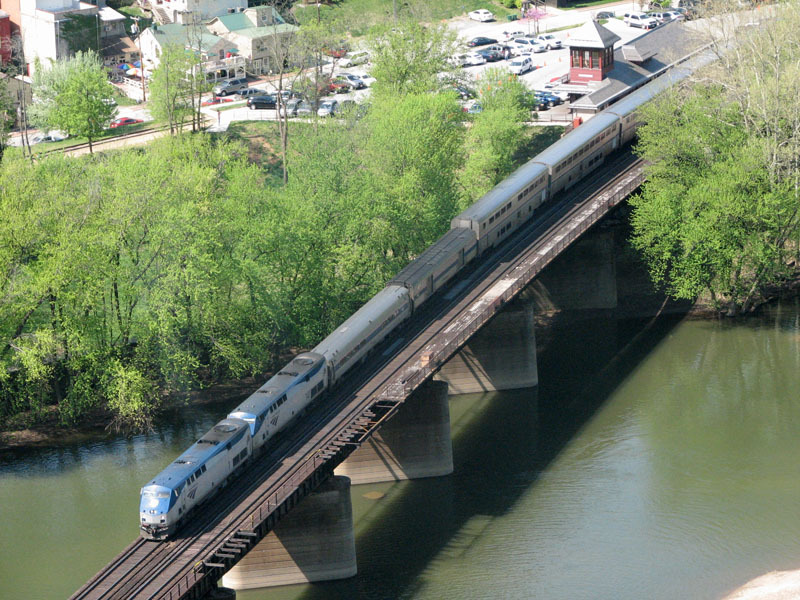 Often I even experience the rush of the trains while running in this area – trains that are crossing the river with their horns blaring, or those on the tracks on my side of the river south of Harpers Ferry, and those on the tracks on the far shore of the Potomac north of Harpers Ferry. 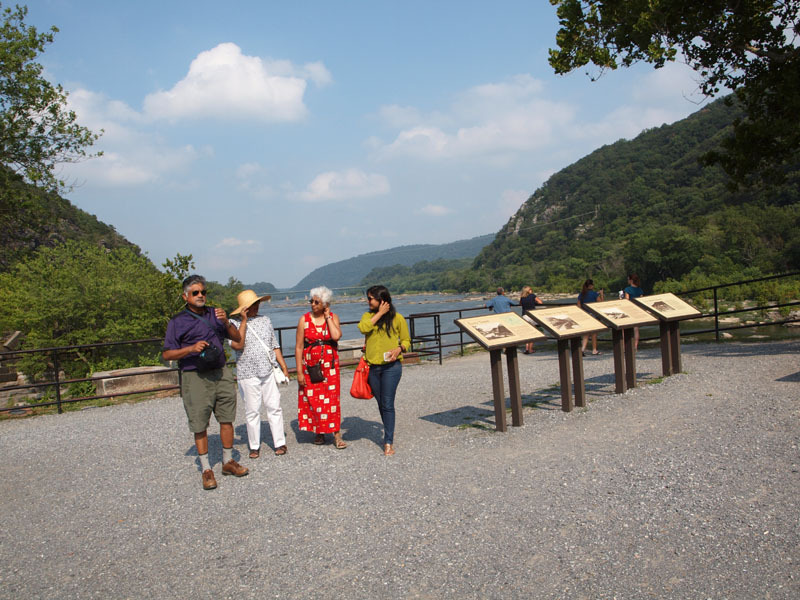 There are the pictures taken from the tip of Harpers Ferry where the Potomac and the Shenandoah meet. Then there are the pictures taken from across the Potomac river, from Maryland Heights. When we have guests visiting, a view of the confluence of the Shenandoah and Potomac is a must. 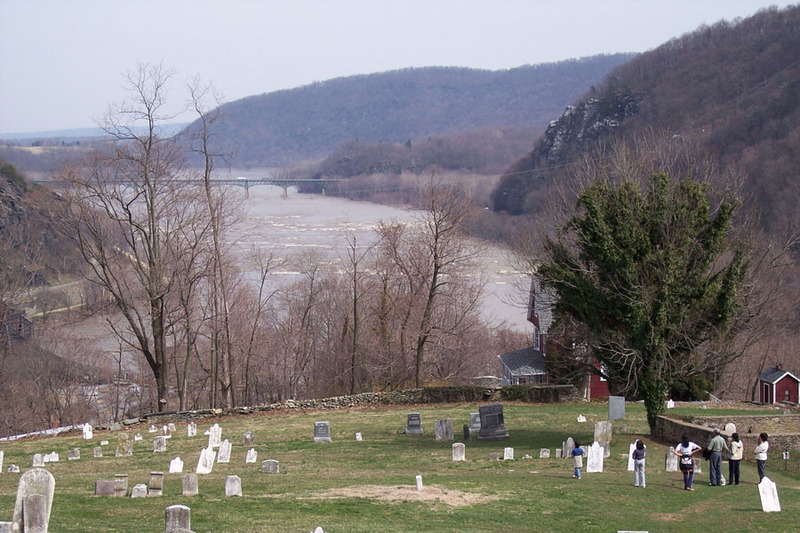 Here is picture of the river flowing in the direction of Washington, DC, taken from high up on a hill in the Harpers Ferry cemetery . This picture was taken in 2005. It has been a while since I ran on the C&O canal across from Harpers Ferry, and this is primarily because the weekend exercise routine has changed in recent times. But I do miss the experience, and the connection still remains. I still hold a hope that I will be able to return to the activities of my past years. This note was written in 2005. As you can see, I considered what I had accomplished that day very significant at that time, when it fact it could be considered just another minor milestone in the story of my life. But perhaps it did also affect my psyche in a way that led me to the place I am today. Who is to say! As a point of reference in time, I got my first digital camera only a month after this outing on the C&O canal towpath. I reached my Destination today, February 13, 2005. Alleluia and Glory be!!! 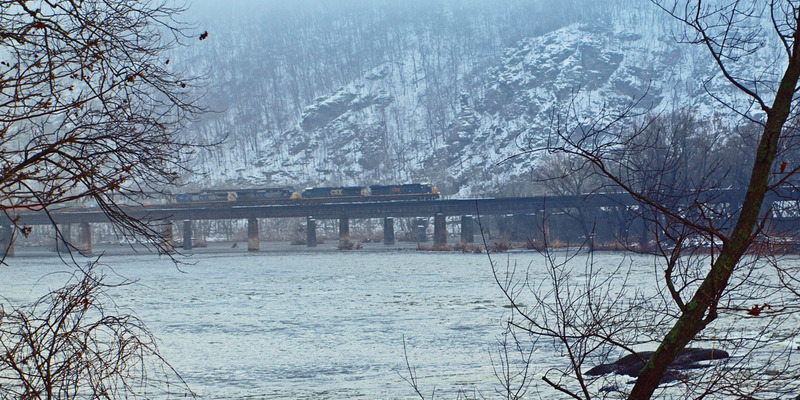 The B&O railroad crosses the Potomac at Harpers Ferry. 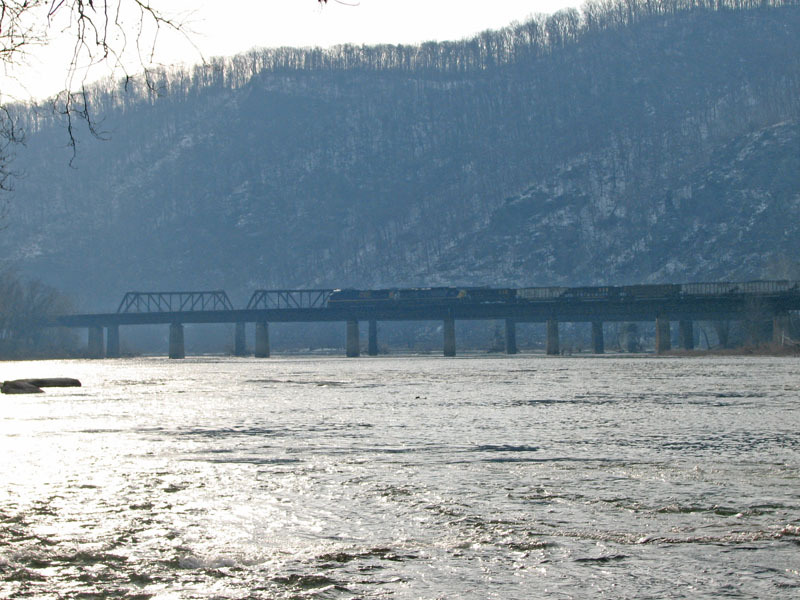 The railroad lines emerge from a tunnel on the Maryland side and split in two directions, over two bridges, as they cross the river, with the bridges passing on opposite sides of the town of Harpers Ferry. These bridges over the waters are an impressive sight. There are also remains of older bridges across the rivers to be seen around the town. The rivers are wide and the waters very rough. This is white water territory! Over the centuries, the waters have cut a notch through the mountains, and there are cliffs and hills all around. It is both pretty and powerful at the same time. 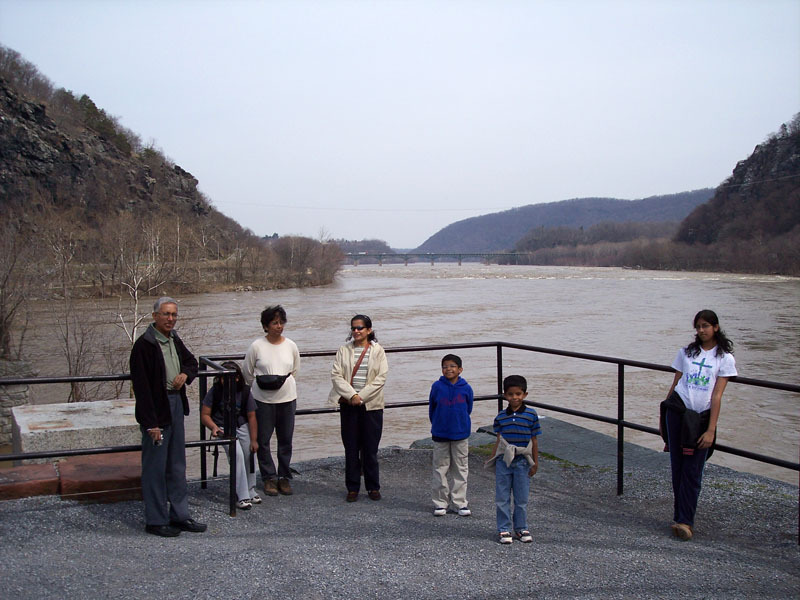 We have visited Harpers Ferry a few times in the past. I have noticed the C&O canal towpath during those trips and made note of the fact that the trail runs all the way up from Washington, DC. I remember thinking to myself at that time that it would be extremely cool to come up the towpath from Montgomery County by bike. Well, I have done it, not by bike, but on foot, and not all in one day, but over a period of months. It is my destination! When we were growing up in Madras, there were a couple of books that I loved to thumb through. Both were travel books and had lots of pictures in them. One of the books was of travels in the USA and the other was of travels in other parts of the world. 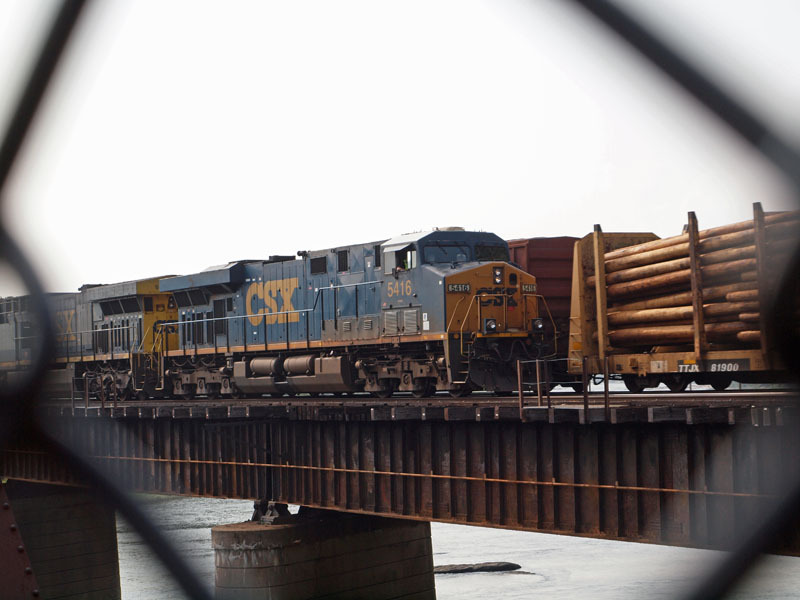 There is a picture from one of the books that has been stuck in my head – it shows a train crossing a bridge over a river and the railroad track splitting off in two directions on the opposite side of the river. In my imagination, this is the town of Harpers Ferry. I remember that when we first visited this town, this was the image that came to mind. The thought, most likely a figment of my imagination, was that this was something that I had seen in books as a child, but now was fortunate enough to experience first-hand. Yes, this is my destination! Harpers Ferry is at mile 61 on the towpath, and quite far away from home. This is probably the limit of where I can get to comfortably without stretching myself too much. In fact, I had to get on the highway at 6:40 am to make sure that I got there at a reasonable time to start the run. This is yet another reason for me to consider this as a destination. I will pause at Harpers Ferry for a while, take a measure of what I have done on the towpath thus far, and consider setting other goals for the future. Meanwhile, there are miles to be covered over and over again, and trips that will surely give me new experiences with the River. The run between Brunswick (mile 55) and Harpers Ferry took me from a familiar set of surroundings into new and different territory. So far the canal has mainly run through heavily wooded areas, and the river has tended to be a quiet beast for the most part, showing itself occasionally through the branches of the trees. As one gets closer to Harpers Ferry, the towpath is right up against the river. The area is completely open and there are very few trees around. You are running on an embankment completely exposed, about 20 to 30 feet above the river on one side, with the dry canal bed just a few feet below you on the other side. You realize the magic of the system of locks, that allows them to maintain the waters of the river and the canal at different levels. (This area has quite a few locks because of the significant drop in the level of the river.) As an added bonus, you have the B&O railroad on the other side of the canal, and I saw quite a few freight trains rumbling by. This place tends to be noisy – there is also road traffic from route 340. You also pass by the little town of Sandy Beach which is essentially a row of houses parallel to the canal, railroad tracks, and road, with its back up against a hillside. On the way back from Harpers Ferry, as I pulled out of the parking spot under the shadows of the cliffs of Maryland Heights, I decided to take the road less traveled. I turned off the highway onto a local road, led by a sign that simply said “Brunswick” and “Route 478” on it. I did not have a map in the car, and did not have a clue about route 478, but I decided to be adventurous anyway. I ended up on a fairly empty road running past the railroad tracks. I went though the little town of Knoxville, with its traditional main street and its multicolored row-houses, and eventually ended up in Brunswick, MD, at its sprawling railroad yard. I drove over the tracks and into the parking lot for the towpath by the river. Although I had run past it in the past, this was the first time I had actually driven to the lot. It looked safe. Next time I will know where to park in Brunswick. So, faithful readers who have stuck with me through my travels and through this long essay, this is the end of a stage in my travels. Who knows where the next voyage (if there is one) is going to take me. I have seen many faces of the River, and hopefully the next time you visit us, I can take to the spot on the river or canal that best fits what you wish to experience – whether it is quiet and solitude, whether it is unimaginable beauty, whether it is awesome power and fury, or whether it is just a simple picture of the timeless flows of a wild and untamed river that has always been, and will continue to be. Until whenever – Adios Amigos! As you can see from the pictures I took with my analog 35mm camera during my run, I did not actually enter the town of Harpers Ferry that day. I only saw it across the river as I ran on the trail. Regular readers of my blog will also know that I have traveled further along the towpath in the years that have passed since that day, including a trip that covered the entire distance from Pittsburgh to the Washington, DC, area – the Great Allegheny Passage from Pittsburgh to Cumberland, and the C&O canal towpath from Cumberland to DC. I do not consider Harpers Ferry that far away from home these days. Times and perspectives have changed. These pictures were taken during one of our Sunday walks towards the end of May. The aqueduct carries the C&O canal across the Monocacy river. This kind of flooding happens every once in a while, and most often during the spring season when we get a lot of rain. The accumulation of the debris is somewhat unusual. The last time it happened they had to bring in heavy equipment to remove the tree branches that were caught on the structure of the aqueduct and putting pressure on it. The following picture was taken during the same walk at a different location on the trail. This is upstream on the Potomac river. I was reminded of this old email that I had sent to family and friends because of some recent news that I blogged about. I will explain at the end. Ok, I am being overly dramatic! It is not a legend. It is merely a curious story. The particular name in the title has the remote possibility of attracting the attention of suspicious people who like to keep track of activities on the Internet – even though the story is quite old at this point. Anyway, back to the story. By the way, if you are interested in a really good (but completely humorless) movie about the kind of people who came together to form the CIA during that time, I would recommend The Good Shepherd directed by Robert De Niro. and then followed the Mount Vernon trail south, past Roosevelt Island and the various bridges that span the Potomac. I followed the trail as it paralleled the George Washington Parkway all the way to Gravelly Point Park at the end of the longest runway for Washington National Airport. I spent some time at Gravelly taking pictures and watching the planes landing and taking off. On the way back, I crossed over the river at the 14th Street Bridge into Washington DC. I got off the bridge close to the Jefferson Memorial, and then worked my way back up north along the river, past the Lincoln Memorial, the Kennedy Center and the Watergate buildings, to the beginning of the towpath. I then followed the canal back to Fletcher’s Cove. Next time I come to this area I will try to explore the trails on Roosevelt Island, and also try to find the trail along the edge of the river north of Key bridge on the Virginia side. Today’s Postscript: Coming back to Mary Pinchot Meyer, mentioned in the first section of the above email, the cops tried to pin her murder on a black person, Ray Crump, who happened to be in the general area. Dovey Johnson Roundtree, the subject of my previous blog, was the one who was able to get Ray Crump acquitted of the crime. It was quite an achievement for a black woman lawyer in those days! Since I wrote the original email, I have been to this area, and traveled this path, several times on a bicycle. I have taken the 18 mile long Mt. Vernon trail all the way to Mt. Vernon. I have however not been to Roosevelt island yet! I have also walked the trail on the Virginia side of the Potomac up to the Chain bridge under very trying conditions. That was the subject of another email blast, an email that I might rediscover some other day. By the way, I have not seen a memorial to Mary Pinchot Meyer in subsequent years at that location, but this could possibly be because I have not been on that section of the towpath at the right time of the year. Jeff French and I were lifting this ugly piece of furniture over the stairs at the entrance to the apartment building. It was an oddly shaped green table, with a backsplash and long legs, and it was also quite heavy and ungainly to carry. We were going to Apt 13 on the ground floor, but the brilliant designers of the particular apartment building had put in steps to first take you up about half-way to the next floor and then back down again to the level of the apartment. (The thinking process behind such a design is mind-boggling!) So, here we were lugging this monstrosity up the stairs – when the backsplash that I was holding on to (which I should not have been doing in the first place) separated from the table. I lost my grip and the table landed on the steps. Luckily it did not have too far to go. It hit my thigh as I fell back against the steps and sat down. Never mind – not much harm done other than a bruise and some soreness in the thigh. We then somehow got this thing into the apartment and were greeted by the fellow who lived there. He seemed to be somewhat incoherent. He had bandages on this foot, had some trouble walking, and was apologizing profusely about not being able to help. Jeff thinks that the person was doing this because his pride had been hurt because he could not help, but I think that this dude was still drunk from the previous night (or maybe he also had something that morning). His wife kept telling him to get out of the way, but he kept on getting in the way, until he had to stop because of the pain. The couple tells us that they want this huge table in their small kitchen. We manage to get it in there, but there is not enough room. When we finally get the table against the wall, we see that there is not enough space to open the door of the fridge completely. (The dude is going to have a hard time getting that beer from the back of the fridge!) There is nothing more to be done about it, and Jeff tells the guy not to call us later to take the table back. We then also deliver a computer table to the folks. We barely manage to get this other rather forgettable piece of furniture into the apartment, this time without it falling apart in our hands. The thing is very heavy because it is made of particle board, but unfortunately it is not very strong. I wonder how long the table will last. Fun times at the furniture program! I was out in the back yard yesterday afternoon, standing on a ladder trying to take pictures of the beautiful white flowers on the Crape Myrtle tree, when I noticed the robin standing on the lawn. I got down from the ladder and tried to walk across to the other side of the bird to take its picture with the right lighting. But the bird did not cooperate. It kept moving in the same direction that I was moving in, parallel to me. Eventually I had to give up. It was when I looked back towards the deck that I noticed a nest under the deck, on top of one of the beams that held the deck up. I could see the tiny beaks of the babies facing upwards in the nest, as if expecting some food to be delivered. I was convinced that the bird I had encountered had in fact been trying to lead me away from the nest. Anyway, when I came back later the bird was in the nest trying to feed the young. Another robin was sitting on the neighbor’s fence with stuff in its mouth, but it flew away when it saw the humans. The first robin stayed put in the nest looking at me. It was not about the abandon its young that easily. Another cycle of life begins under the deck. I have been trying to get some inspiration to write during the past few weeks, but all I see in front of me when I sit down in front of the computer has been a blank page. There are too many cobwebs in the mind, and it is difficult to escape the spider’s clutches. My mind is out of whack. Anyway, I did a run on the C&O Canal towpath from Brunswick to Harpers Ferry this morning in an effort to loosen some of the cobwebs. It was a cool cloudy morning, and it was positively cold on the bridge at Harpers Ferry with the wind blowing between the cliffs. The waters are low on the Potomac and there were a few intrepid folks who were making their way towards the middle of the river by trying to climb over the exposed rocks. Much of the murky green water that is a fixture in this section of the canal is gone but not all of it. It is a good breeding ground for skeeters, but none bothered me during this run. (What in tarnation are skeeters, you ask? You will have to find out yourself.) I had company from the freight trains on the other side of the canal, including a monster train led by 5 or 6 diesel locomotives pulling more than 130 cars (yes, I stood there and tried to count them all!). I still feel a rush when one of these trains roars by blowing its horn, shaking the ground, and causing dry branches and other things to drop out of the trees. This is what you call POWER, baby! 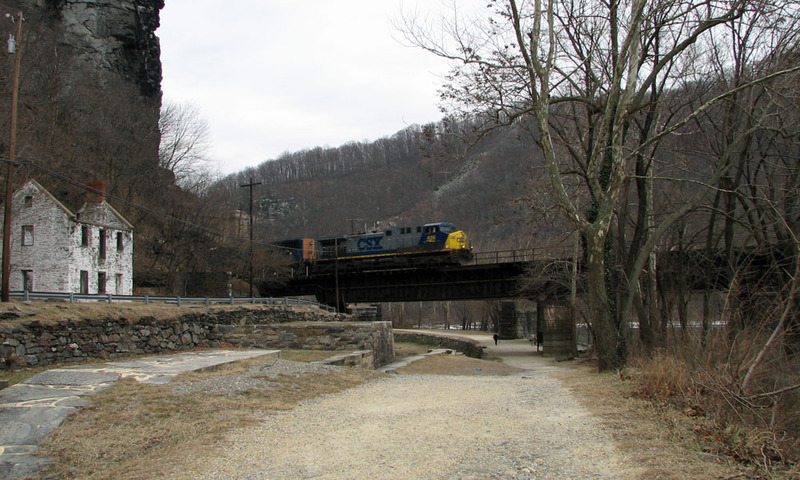 I managed to even get myself in position to take a picture of a locomotive rushing out of the tunnel at Harpers Ferry. OK, so I get my kicks out of some very simple and perhaps silly things! What is the harm? I need to get my laughs before the spider gets back….